Yabang Pinoy Blogger's Night + Giveaway! I know this is super late but I intentionally delayed this post. Wanted to share this near the Global Pinoy Bazaar event date so you won't forget! Hehe. Anyway, a few weeks back I, together with blog friends Ana & Vern, attended the Yabang Pinoy Blogger's Night at Bo's Coffee. Met new blog friends there too, Hi Megann & Krista! Love how the event was super intimate. It was raining super hard that day (hello typhoon) but I went anyway. You all know how much I love socially relevant events. So here are photos and some captions underneath! READ the screen (click to enlarge) to know what Yabang Pinoy is:) Love their advocacy! 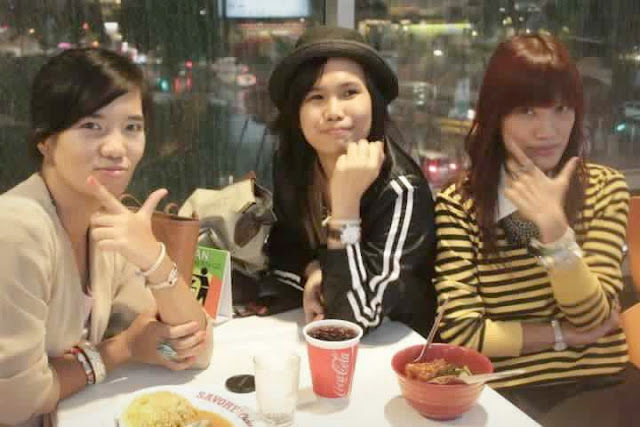 with Geri of YP and Megann! us wearing our YP abaca bands! With this, I would like to share with you guys their upcoming project--the Global Pinoy Bazaar! Pooling together local brands/products in one amazing venue is I think brilliant. 1. Follow Yabang Pinoy on TWITTER & FACEBOOK. 2. Answer this question, "Ano ang maipagmamayabang mo bilang isang Filipino?" 3. Repost your answer to #2 to any social networking site, tag me and Yabang Pinoy, leave URL below. 4. Leave your name & email address below. Winners would get 2 tickets each. Will choose 10 winners on Oct. 31. Gooow! P.S. Win free tickets to the MULTIPLY Shopping Party! Click HERE. P.P.S. Last week of my MAUVE Accessories giveaway! Join now. Thank you for sharing! I'm proud pinoy! Ang maipagmamayabang ko bilang isang Filipino ay ang pagiging madasalin at matatag kahit ano pang sakuna ang dumating.